The resort of Pattaya is located south east of Bangkok, less than a 2-hour drive from the airport. The region hosts the greatest variety and highest density of the finest championship golf courses in Thailand, and is a paradise for a golf holiday. Originally, Pattaya was a quiet fishing town with idyllic beaches. However, this soon became the destination for American troops on R&R during the Vietnam War, and a multitude of bars, neon lights and shows quickly appeared. This led to a less than complimentary image but this is rapidly changing and now Pattaya is a popular destination for families, conferences, and business travelers alike. Read more about Pattaya in the continuation of this post. In addition to golf, Pattaya provides many water sports for visitors. Jomtien Beach is the windsurfing mecca of the country, with its long white sandy beaches along a palm-lined promenade. Island hopping is also popular, as an easy 30-minute boat ride will take you to isolated beaches for swimming in aqua blue waters with amazing coral reefs. There is no shortage of eating choices, with many local and international restaurants. Some of the fine international restaurants from Bangkok also have a sister operation here, with the choice of every cuisine. Because of its fishing village history, you will also find some of the best seafood restaurants in the Thailand. On the shopping front, there are both a number of large malls together with with street side stalls selling everything imaginable. The Night Market truly has something for every taste, and offers every conceivable designer label. 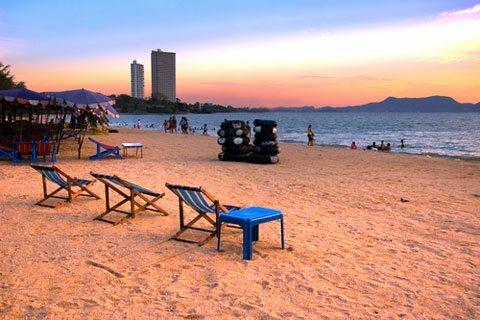 Because of the vast number of golf courses available, together with it’s famous nightlife, this makes Pattaya this a very popular destination for a number of visitors, more so with groups of individuals than families. Also, with its close proximity to Bangkok, many people like to use it as part of a 2 center destination.